So, next week the Scots will decide if they want to be independent. Let me start by declaring a lack of interest in this issue. A complete lack of interest. I think may be one-eighth Scottish but I really don’t care if I have Scottish blood coursing through my veins. It hasn’t affected my life either way. I have been to Scotland a handful of times. I have watched a couple of rugby internationals in Edinburgh and stayed with some friends in the Borders which was good fun. I may have been to Glasgow once to be on local radio but I really can’t remember. Nor can I be bothered to find out. It really doesn’t matter either way. I wonder how many Scots have heard of ‘ASEAN’? ASEAN stands for the ‘Association of South East Asian Nations’. It is the Asian equivalent of the EU. And, Scot or not, you need to know about ASEAN. Especially now. I worked in the ASEAN region over twenty years ago. Thailand to be precise. In Thailand, I learnt a lesson that I would like to share with the people of Scotland. I am sure the Scots care as much about me as I do about them but, if they are prepared to consider what I have to say, they may agree that they would be mad to vote for independence next week. Not that I care if they do or not. It is nothing to do with me. As I have said. There is a thing in marketing called distribution. To all the world’s major marketing companies, ‘distribution’ is key to their business. Fundamental. Now, I know it is easy to be cynical about marketing. Just as it’s easy to be cynical about lawyers or accountants. The UK government is even cynical about doctors, for goodness sake. As the writer Charlie Kaufman said: ‘it (the world) is all marketing’. Take it from me, your life would be a lot worse without marketing. Your quality of life would decrease. You might not survive at all. The biggest marketing companies in the world are fmcg businesses. The acronym ‘fmcg’ stands for fast moving consumer goods. These products are not described as ‘fast moving’ because they are jet-propelled, or laxatives. They are fast moving because they move fast off the shelves of your local supermarket. People want them. People buy them. Lots of them. Often. Every day. Take it from me, the world’s major fmcg companies would not bother to manufacture these products without knowing how they are going to distribute them – and working out how many they are going to sell based on how often their customers will buy them. This is a more exact science than you might think. And it can lead to more ruthless decisions than you might like. Let’s go back to Thailand. I wish. For nearly three years (1988-91), in Bangkok, I managed the biggest advertising agency in Asia outside Japan – and Ogilvy & Mather’s third biggest office worldwide (bigger than London). It was the best advertising agency I worked for. This was nothing to do with me. It was because of the Thai people who worked there. During my short tenancy, all I did was help the agency maintain the lofty status it had achieved before I arrived on the scene. My key role was to enlighten the bosses of our multinational clients, who invariably came from the USA and Europe, on some basic realities of Thailand and the region – and encourage them to focus their investment on this important growth market. Most of these bosses knew that the populations of China and India were, at the time, about one billion and 800 million people respectively but many of them, in those days, were ignorant of the facts contained in my first, simple PowerPoint slide. These are just some of the countries in ASEAN. There are smaller, less populated countries too. These include Laos and Singapore but, with populations of six and five million respectively, they are not very important are they? Now, let’s put Scotland into perspective (if you haven’t already). We are talking about distribution. Remember? Whenever you buy something from a shop, someone somewhere has manufactured that product, designed the packaging, printed the packaging, put the packages into boxes, loaded them onto a lorry, carried them to the shop, taken them out of their boxes and put them on shelves in shops and supermarkets up and down the land. It is hard work making things easy for you to buy. And, if you are in the business of making things and taking all this trouble to distribute them, it would be natural for you to not only to maximise the number of people who have the opportunity to buy your product but, at the same time, minimise the ferrying around required. Scotland is a relatively large country. And sparse. The land area of Scotland is 30,265 square miles. With roughly the same population, Singapore is 276 square miles. Have you got that? To distribute your product to five million people in Singapore you drive around town for a day. To distribute your product to five million people in Scotland would take you, what shall we say, three months? Or shall we put it another way? In Indonesia, there are 140 million people on the island of Java alone (get that?). The land area of Java is 53,589 square miles. So, in the three months it would take you to drive around Scotland to reach 5.2 million potential customers, you could drive round Java and reach, what shall we say, 80 million? If you are one of the world’s largest and most important marketing companies, and the people of one of the world’s smallest and unimportant countries, like Scotland, decide to strike out on their own and, in so doing, make your life more complicated with different rules and regulations, why would you bother with them? Great Britain – with 62 million people in 88,745 square miles? Maybe. Scotland alone – with 5.2 million people in 30,265 square miles? Forget it man. And don’t tell me internet and online websites like Amazon, who charge for postage & packaging, will ride over the Highlands to the lonely Scots’ rescue. They are not going to offer free delivery to the Outer Hebrides are they? They are going to charge an independent Scotland an independent, increased rate for p&p, as with any other country. This will happen. You mark my words. Now, if you are a Scot with half a brain, or have any idea of how the world goes round, you don’t need to know any more, do you? You can stop reading this now. I’ve made my point. If, however, you feel your reading of Robert the Bruce (really?) or your penchant for wearing kilts or blowing bagpipes will be any way enhanced by being an independent country – let me spell it out for you. Just as I don’t really care whether Scotland is an independent country, the Scots may say they don’t care about the world’s biggest and important marketing companies. This would be a naive, and potentially rather dangerous position. I have attended meetings where these companies have developed marketing strategies and plans to maximise their sales to the massive populations in Asia. There are too many customers to ignore, aren’t there? And, when it comes to Scotland, surely the opposite will apply. An independent Scotland will be easy to ignore. The largest marketing companies in the world include Nestlé, Procter & Gamble, Coca-Cola, Unilever, PepsiCo, General Mills, Kraft, Kellogg’s and Mars. You use – and buy – their products every day. They include bottled water, tea, coffee, milk, cheese, yoghurt, sugar, cereals, toothpaste, soap, shampoo, hair care, perfume, skin care, deodorants, beauty products, baby care, nappies, sanitary care, biscuits, chocolate, confectionary, soft drinks, juices, fruit, food, chilled food, frozen food, ice cream, snacks, pizza, pasta, butter, margarine, cooking oil, olive oil, sauces, soup, vegetables, baking products, crisps, tortilla chips, washing powder, fabric conditioner, household cleaners, batteries, canned food and pet foods. 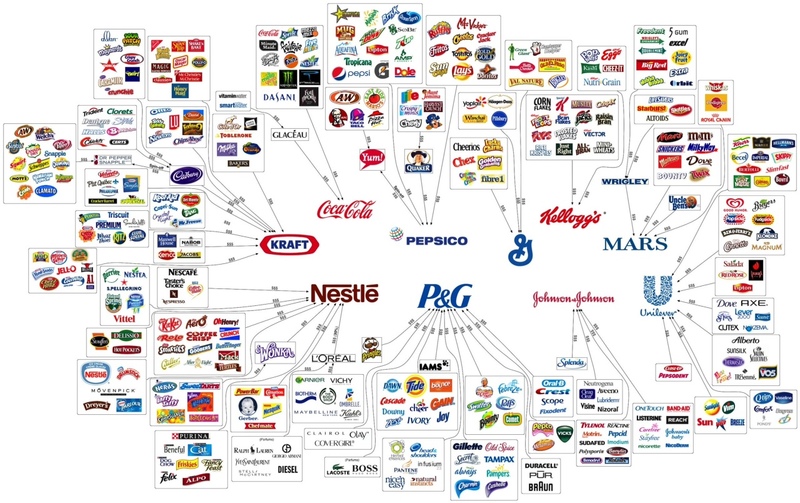 There isn’t time or space here to list all their brands (Nestlé alone has close to 8,000 brands, some of which are on this infographic here (and below). Still don’t care? Well, Scotland, you didn’t know Pepsi own Quaker Oats did you? Or that Quaker Oats, and therefore Pepsi, owns Scott’s Porage Oats? In fact, Pepsi own a mill in your country, in Cupar, which you are about to provide an excuse to close down. Them’s great oats in the USofA! Believe me, in the modern world, you cannot live without these companies. I have no idea whether the world’s biggest marketing companies have any fall-back plans for Scotland. No doubt they will wait and see what happens next week. Nor I haven’t bothered to read and watch the politicians ranting and raving about this referendum. As history has shown, politicians are the last people who can predict the consequences of their actions. Especially politicians who rant and rave. In fact, I suspect all this is a career move by a politician with a surname one letter from mine. We haven’t seen the Scots marching and rioting in the street on this issue, have we? Or anyone jump in front of a galloping horse? Where has all this come from? Deluded, delusional politicians are a very dangerous breed. For if, down the line, their politicians persuade the Scots to launch their own currency or, like Ireland, join the Euro, these kind of manoeuvres will add to the inconvenience of Scotland being part of any company’s marketing plans and increase the possibility of Scotland ignored as some irrelevant little outpost. I accept that, in this day and age, such desperate repercussions may be unlikely but why risk it? Either way, I have no doubt the costs of living in rural Scotland are bound to increase in an independent Scotland. Independence will give all suppliers an excuse to review their distribution arrangements to maximise their bottom line. Mark my words, when the time comes, the food, personal care and household product companies of the world will make cold, rational, ruthless business decisions. There won’t be any emotions involved. This entry was posted in Blog posts and tagged Amazon, ASEAN, Burma, Cambodia, Charlie Kaufman, Coca-Cola, distribution, Edinburgh, EU, General Mills, Glasgow, human behaviour, Indonesia, Kellogg's, Kraft, Laos, Malaysia, marketing strategy, Mars, Nestle, Ogilvy, Ogilvy & Mather, PepsiCo, population, Procter & Gamble, Scotland, Singapore, South East Asia, Thailand, Unilever, Vietnam. Bookmark the permalink.